Life is a roller coaster ride. And not just any roller coaster, it's easily one of the crazy ones from the wildest theme parks out there. Personally I love roller coasters, the wilder the better. However when you're on the ride emotionally and suddenly have to face the downhill part, well lets just say it's not the best feeling in the world. Usually I pacify myself with the old rhetoric about how happiness is a relative concept, hence the sad bits are vital to make you value the happy times. There is a lot of truth in that.Yet sometimes being human with all the usual faults and moods catches up with you. And you are left to face the dark emotions that can overwhelm your soul; those of fear and powerlessness. The first week of April has been pretty rough for me. It was Mothers Day here in UK on 3rd April, and London was flooded with the sweetest and most adorable Mothers Day gifts. Made me muse back to all the happy Mothers Days I had spent with mom when she was alive before she got cancer. My brothers and I would usually take mom out to one of her favorite restaurants in Lahore for lunch, and then we'd all go have ice cream from our favorite dessert spot. Good times however fly by too quickly. It was a pretty rough day, with me wishing mom 'Happy Mothers Day' in heaven via Twitter. I could not even go visit her grave in Lahore to pay my respect, considering I was here in UK. To top it off, my dad had been feeling sick lately and the results of his medical tests came out this week too. The tests results were scary, informing us that two of his arteries of the heart were blocked. What a blow. It was like someone had punched me hard in the stomach, forcing the air out of my lungs, and the pain wouldn't let me breathe. I love art, and somehow the picture posted above found me the same day. I fell in love with it. I could so relate. 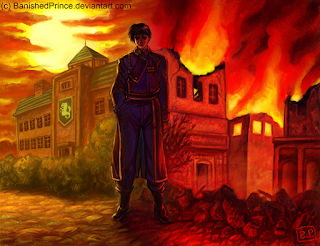 Me standing alone, away from my family, watching everything burn away, powerless against the fire. I was in a deep hole of pain and depression, enveloped by suffocating darkness. However when I looked up from the hole, I saw how people were going on about their lives. The sun still rose. And it showed too, which by London standards is a miracle. There were flowers everywhere. Work didn't stop for me at the office. Spring was here, everyone was all happy about the weather change. And it made me want to make myself come out of this dark hole. Allah has His plans. One does not know what destiny has in store, but when you are powerless to change the outcome, You should just get up and start to move before life moves away from you too. When you feel helpless, you should just submit to the Divine Will and know that God knows what is best for everyone, and each soul has it's destiny to live. In other words, you should just keep walking, and trust God to see through the distances for you. Replace the fear with trust and submission to God's will, or use it to become closer to Allah. It's not easy. I have to still work on this bit, and blogging is my way to heal. It's not easy at all. However as Rumi puts it so beautifully, we must keep walking. Heavy heavy stuff. But yeah, gotta keep walking. maybe not for religious reasons but to make yourself feel better and gain closure. (may be the same thing for some). your blogs are so facinating and whenever I read your blog it gives me more power to fight the material world and the motivation to stick to the right path while struggling with the loopholes of the life. And by writing you have always helped to reverse the psychology of the brutal human posterior which is inevitable to a mimicked compulsive bound of the world.